The ascription of this astrolabe to Jacobus Valerius is on the basis of its similarity to an instrument now in Brussels bearing this name. It may have been made in Spain, but such were the political links between Spain and the Netherlands, that a Flemish origin is at least as likely. 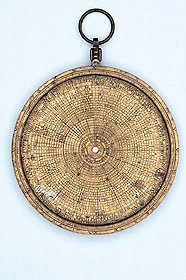 The construction is an extraordinary and challenging one in a number of ways, but perhaps most obviously in the table of numbers on the front, used to calculate oppositions, conjunctions and eclipses of the sun and moon for the Spanish town of Zaragosa, referred to by its Latin name, Caesar Augusta. The whole instrument bears evidence of its sophistication and tells us that it was intended for scholarly and specialist use. For these reasons, it is a particular disappointment that the latitude plates and the rete are missing.